That substance may be sooty mold, which is a fungus that results from the excrement of sucking insects such as aphids or scale. 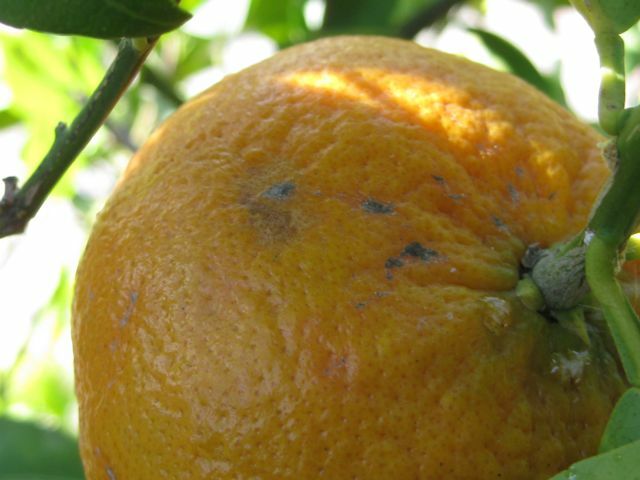 According to the UC Davis Integrated Pest Management experts, sooty molds do not infect plants but grow on surfaces where those excrement deposits accumulate. This excrement, also known as honeydew, is a sweet, sticky liquid that plant-sucking insects excrete as they ingest large quantities of sap from a plant. 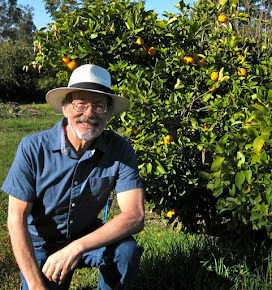 Because the insect cannot completely utilize all the nutrients in this large volume of fluid, it assimilates what it needs and excretes the rest as honeydew. Wherever honeydew lands - leaves, twigs, fruit, yard furniture, concrete, sidewalks, or statuary - sooty molds can become established. 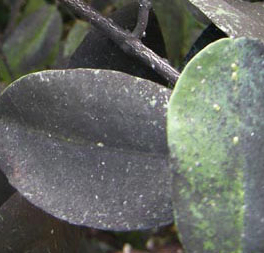 Although sooty molds do not infect plants, they can indirectly damage the plant by coating the leaves to the point that it reduces or inhibits sunlight penetration. 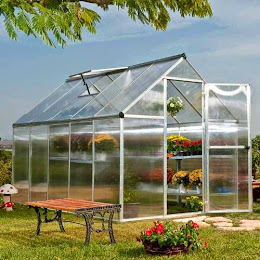 Without adequate sunlight, the plant’s ability to carry on photosynthesis is reduced, which can stunt plant growth. Coated leaves also might prematurely age and die, causing premature leaf drop. And as you pleasantly discovered, fruits or vegetables covered with sooty molds are edible. Simply remove the mold with a solution of mild soap and warm water. 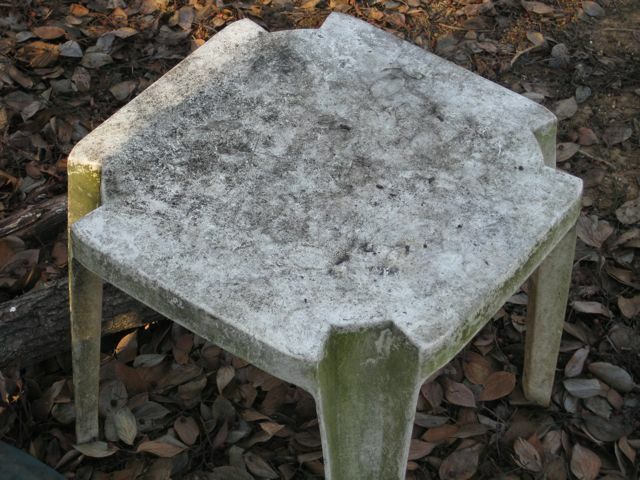 To thwart any new outbreaks of sooty mold, do not overprune, overfertilize or overwater your pest-prone plants, says the University of Florida Ag Service. 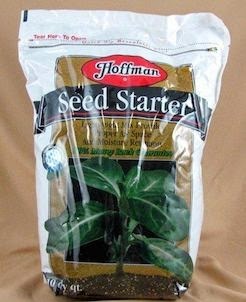 These bad habits can create weak, succulent new growth on the plants, a delicacy for sucking insects. Beginning of sooty mold. Note the small white mass of scale on the stem. To control sooty mold, you have to control the pests. On citrus, soft scales, such as cottony cushion scales, are the usual culprits. 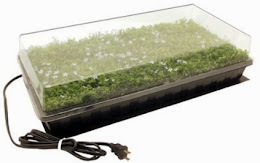 This scale can be controlled with a light horticultural oil when the scale are in their crawling stage. Sooty mold can attack any plant that may have an infestation of other sucking insects, especially aphids, leafhoppers, psyllids, and mealybugs. 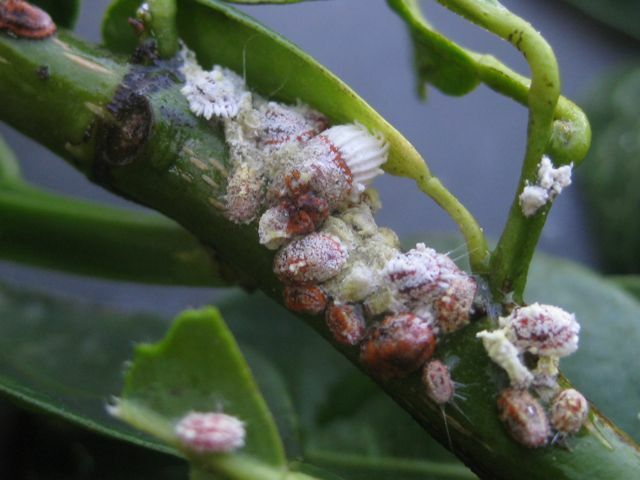 The UCD IPM pros also advise against using insecticides containing the active ingredient imidacloprid for controlling this pest. 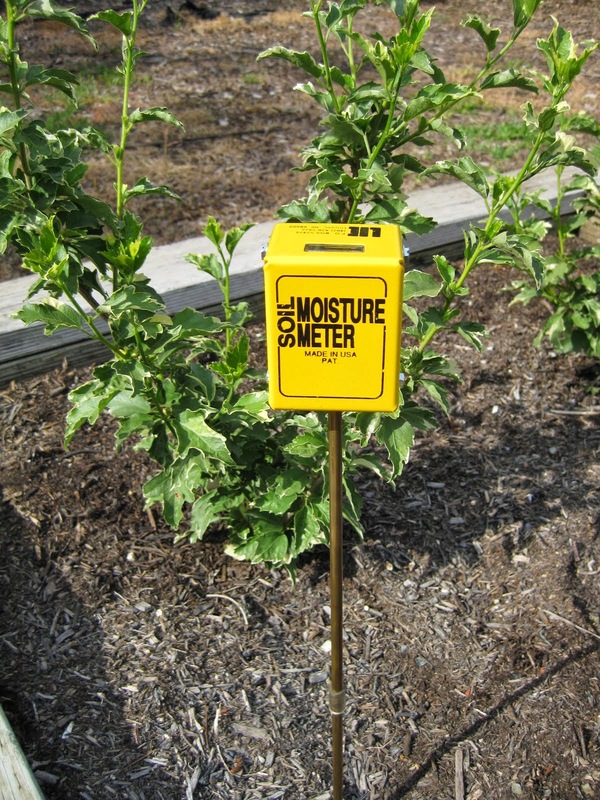 Although scale is listed on the label as a pest that it can control, it is not effective against cottony cushion scale. To complicate matters, imidacloprid will reduce populations of the beneficial insect, the vedalia beetle. 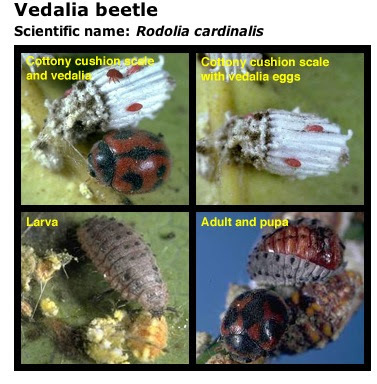 Both the adults and larvae of the Vedalia beetle feed exclusively on the cottony cushion scale on a variety of plants including rose, acacia, magnolia, olive, and citrus. One product that can help control many of these pests, while washing off the sooty mold from leaves or fruit, is insecticidal soap. Even a blast of water from the hose can help wash off the sooty mold without harming any beneficial insects that might be trying to help you out. 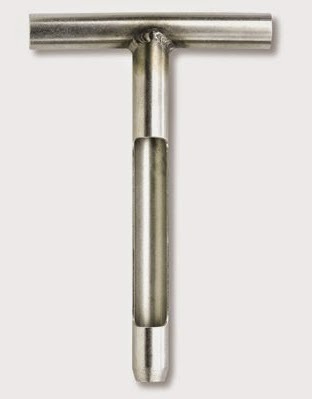 Horticultural oils or Neem oil can also suppress scale populations. Also, look for ants crawling up and down the tree. Control the ants, and you can control the pests...as well as the sooty mold. Ants herd and protect sucking insects from beneficial insects, in order to harvest the honeydew for the ant colony. Baits containing boric acid placed around the base of the tree will control ant populations in a couple of weeks. 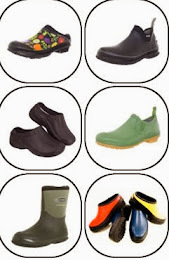 Sticky substances, such as Tanglefoot, although messy, can stop ants. 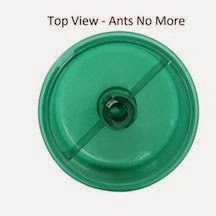 See this previous post on ant control. Be sure to wear rubber gloves when cleaning with this solution. My little dwarf Meyer lemon tree in a pot produced 14 tasty lemons in its first year! I was keeping it on the porch all winter to protect it from storms and frost, and when it was raining so hard I had ants. 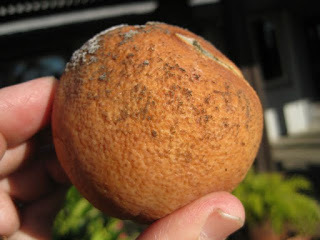 The leaves got sticky with a black sooty substance, and the lemons also developed sooty stuff on their skin that did not damage the fruit inside. 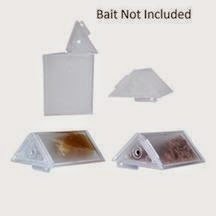 I used Terro (borax traps) to get rid of the ants and that did slow down the infection. 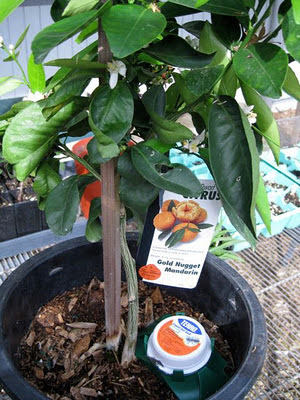 Now the tree has been moved to a bigger pot and is out in the sun, starting to bloom and put out new leaves. I am grateful this condition is not some awful citrus disease, and I will keep ants away from the tree. Only way I've found to remove sooty mold is hand cleaning the leaves of citrus. However, I just caught a snail cleaning my citrus leaves of sooty mold while the mold was wet. Perhaps an indo asiatic land snail? Not having an issue of snail attacks of citrus, so I`ll let them continue. However I believe 90% coverage of sooty mold is detrimental to respiration of CO2 and plants ability to expel oxygen. Perhaps a bigger problem to plants health then just blocking sunlight. Not having much luck with snails cleaning my citrus completely but interesting to note. Perhaps there's a way to promote this to achieve a satisfactory result without the labor intensive cleaning of leaves.